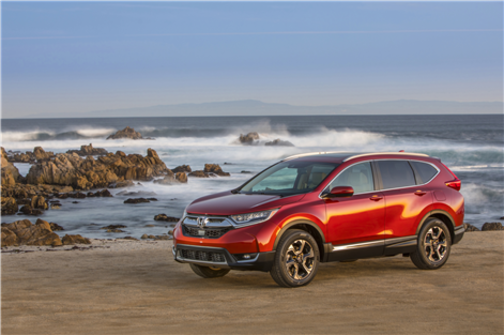 The Honda CR-V was already one of the most popular compact sport utility vehicles on the market when Honda decided to introduce the fifth generation of the CR-V. The 2017 Honda CR-V takes over where the previous model left off with a host of new features and enhancements in terms of safety, performance, efficiency, design and connectivity. Let's start with the changes under the hood. The 2017 Honda CR-V is available with a single engine, a 1.5-liter four-cylinder engine developing 190 horsepower and 179 lb.-ft. of torque. This is the first time that a turbocharged engine is found under the CR-V’s hood, and in addition to being more powerful (five more horses than the model it replaces), the new CR-V’s engine is also more fuel-efficient. Combined with a continuously variable automatic transmission, the 2017 Honda CR-V comes standard with front-wheel drive while all-wheel drive is optional for greater stability on an icy or snowy surface. FWD models show an average fuel consumption rating of 7.8 liters per 100 kilometers combined, while all-wheel drive models feature an average fuel consumption rating of 8.7 liters per 100 kilometers in the city and 7.2 liters per 100 kilometers on the highway. There is no doubt that the 2017 Honda CR-V is one of the most fuel-efficient compact SUVs on the market. In addition to the improvements made to the engine, Honda engineers have also enhanced the safety of the 2017 Honda CR-V. All of the active safety technologies included in the Honda Sensing package can be obtained from the LX trim starting at $ 29,490. This model also offers all-wheel drive. Honda Sensing includes several technologies designed to prevent accidents by warning the driver of a danger – another vehicle suddenly braking, a lane deviation, etc. - and then to intervene if the driver does not react to the danger. The technologies included in the Honda Sensing system include automatic barking with forward collision warning, lane-departure detection and prevention, and adaptive cruise control. Available starting at $ 26,690, the 2017 Honda CR-V comes standard with a remote starter, heated seats, keyless entry with push button start, Apple CarPlay and Android Auto connectivity features , and much more. In terms of storage space, the new 2017 Honda CR-V offers 1,110 liters of cargo space with all seats in place, and 2,146 liters with the rear seat down. This is one of the most spacious compact SUVs in its segment. The 2017 Honda CR-V has a lot to offer, with its more modern styling, spacious interior, numerous safety features and efficient, powerful engine. 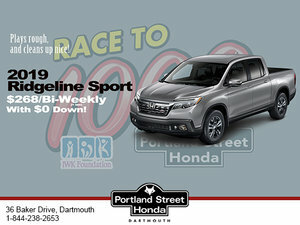 Come and discover it today at Portland Street Honda!